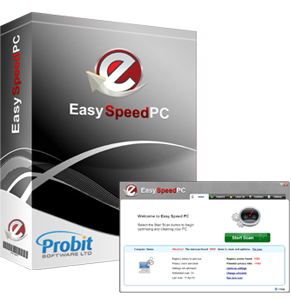 Easy Speed PC is one of the most useful programs you could download on your computer! With several tools integrated into one simple-to-use interface, you can be confident that your PC is running in tip top shape. One program gives you the tools you need to identify, repair, clean and boost your PC system. You would have to download and maintain several programs to get all of these tools anywhere else! Let Easy Speed PC deep clean your system, registry and files to clear up much-needed storage space, tie up loose ends and remove corrupt files. Do you constantly receive error messages on your computer? Are there invalid files and registries on your computer that cause it to freeze or crash? Easy Speed PC can solve these problems! A few clicks allow you to identify and remove registry errors, corrupt files and unwanted programs. Junk files and old registry entries can cause instability within your system, making your computer prone to malfunction and break down. On top of removing these old files, Easy Speed PC can also help identify potential problems within your system that can cause slow performance. With Easy Speed PC, you don’t have to spend hours on end cleaning your computer, reading the registry and changing settings to boost performance and response time. Take a few minutes to download Easy Speed PC and let it do all the work for you! Visit Easy Speed PC website!